Kyle and I will be attending StokerCon this year and have a few things going on. We will be doing a poetry reading Thu, April 27, 4:30pm – 5:00pm at the Wedding Chapel. Friday, April 28th is our Dark Poets Face to Face / Marge Simon, Kyle Opperman, Ashley Dioses, John Reinhart, Terrie Leigh Relf panel at 5pm – 6pm in the Britannia Salon. A select panel of talented contemporary horror poets read and discuss each other’s works. Audience participation welcome. Chad Hensley / Elsa Carruthers / G. O. Clark / Lisa Lane / Chad Stroup / Robin Reed / Kyle Opperman / Ashley Dioses / Megan Rhode / Michael Arnzen / Gregory Bastianelli at the Promenade / Dealers Room. I did send the Mysterious Galaxy table a few journals/magazines to sell. The Renaissance Pleasure Faire in Southern California begins next month and it runs between April 9th through May 22nd on weekends only from 10 am to 7 pm. I work at the Queen's College which is a group of educational workshops that teach a skill, a craft, a trade, etc. "Queen’s College invites Faire visitors to learn historic art and craft found in our Port village. Master artists, artisans, and traders teach their craft in workshops to adults, teens, family groups, and children. Workshop students receive supplies and tools needed to make their own keepsakes, and some will have kits to continue working at home. Fees are low ($3 to $25) with the average $10 since we are under the auspices of a nonprofit educational organization, the NorCal Renaissance Institute for Renewal of Past Arts and the Artist. Drop-In Workshops run for 1-2 hours and allow students to come in during the time to learn, and Scheduled Workshops are listed with a starting time. Some workshops are short (perhaps 15 to 20 minutes), but most will be about 45 minutes. Ask if time is important to you. It is possible to pre-register at the College to guarantee a seat at a later workshop." The class that I teach is called Visit the Tarot and I teach students a little about the Tarot and how to read them. I provide a packet to take home which goes over everything that I teach. I DO NOT sell Tarot decks, but I will tell you how to acquire them. It is not necessary to bring your own; I provide a few different decks to use and look at. I also DO NOT read your fortune with them. 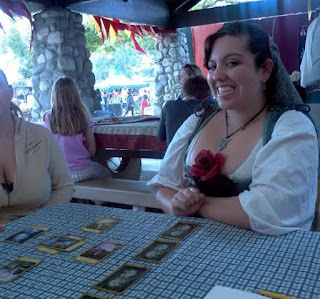 There are about three different Tarot readers toward the end of the faire who do great work; if you want your fortune read with Tarot, go see them. I am not allowed to, so please don't ask. This will be my 4th year teaching this class. I started for only an hour in 2011 for I was doing multiple faire jobs and then I was solely a part of the Queen's College in 2015. I will be attending the StokerCon 2017 April 27-30. Needless to say, I won't be teaching Visit the Tarot those days. This is the only faire I teach this class at; I do not travel to other faires. I also do not teach this outside of this workshop. So please come visit the Renaissance Faire this year and learn how to read the Tarot with me! Classes are $12.